Traveling North on I-95 through Philadelphia, you can see a hulking landscape of mounds and machinery silhouetted by the Delaware River. This conglomerate of abandoned and still-functional factories, smokestacks, waste management plants, and masonry production sites is both appealing in its aesthetic of decay and troubling as a patchwork of industrial blight along the shoreline. Among these various harbingers of urban decimation is Revolution Recovery, located in an unambiguous facility that, from all outside appearances, operates as a garbage transfer station – trucks roll in and deposit trash-filled dumpsters behind a chain-link fence, through which enormous piles of waste can be seen. 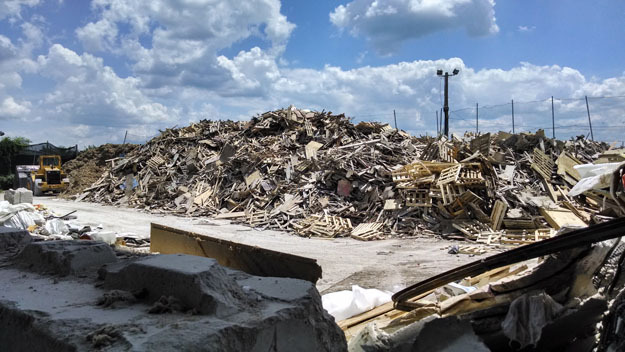 But Revolution Recovery is one of a handful of disposal sites committed to reusing, rather than dumping, materials brought there, and processing waste for resale. It also hosts the Recycled Artist in Residency (RAIR) program, which facilitates a unique engagement between artists and the waste. Artists in residence work within, around, and alongside this high volume recycling facility, which mainly processes construction and industrial materials. Led through the grounds by one of RAIR’s studio assistants, one encounters a complex mechanism designed to organize waste. In one immense room an endless stream of detritus runs along a conveyor belt on a platform near the ceiling, sorted by type at the hands of a dozen masked and helmeted professionals, while a light mist rains down on them for dust control. Another room holds barrels of corrugated cardboard, rolls of carpet, and balled tangles of ribbed wiring. Outside in the yard large heaps of wooden pallets, pebbled concrete, and powdered drywall are piled and compressed by backhoes, which deposit, dig through, and climb these small mountains. RAIR co-founder Billy Dufala compares their cumbersome agility to dinosaurs and he is amazed by their operators’ ingenuity in inventing new techniques for their use. The yard is frequently cleaned with mattresses that are held in the claws of the machines and dragged across the wet ground like giant mops (unfortunately, mattresses are rarely recycled, due to their diverse and deeply imbedded material composition). In another part of the facility RAIR offers its artists a studio that has an attached metal and woodworking shop with ample space both there and on the grounds outdoors for them to build. If Marcel Duchamp gave artists permission to manipulate a bicycle wheel with the same depth and sincerity as a full palette of paint, then RAIR seeks to take this acceptance of the random and discarded as a given, pushing the readymade sensibility into our contemporary reality of excess, overproduction, and a seemingly endless supply of waste material. Its artists also manage to avoid the kind of basic exploitation or simplistic presentation of the absurd as a symbol of our society’s ills, prevalent in a great deal of work that more directly engages the Dadaist movement or the more political elements of waste management. The idea of art made at the garbage dump might conjure up visions of Jean Shin-style installations of glass and plastic bottles in a white cube, or the glorification of some once-perfect object made terrifying by decay – like the frequent practice of strapping stuffed animals onto the grilles of garbage trucks. Most of the artists who come through RAIR produce work that absorbs the direct legacy of the materials they employ without overtly discussing the eco-historic-narrative elements at play. The site of Revolution Recovery is frequently used as a backdrop for documentation and performance, activating the generative qualities within this wide expanse of space. Rather than celebrating the uniquely ridiculous or condemning consumer culture, the residency challenges its artists to incorporate the materials into their work. That there is a seemingly endless supply of waste to be harvested is taken in stride as a given, a fact of life. 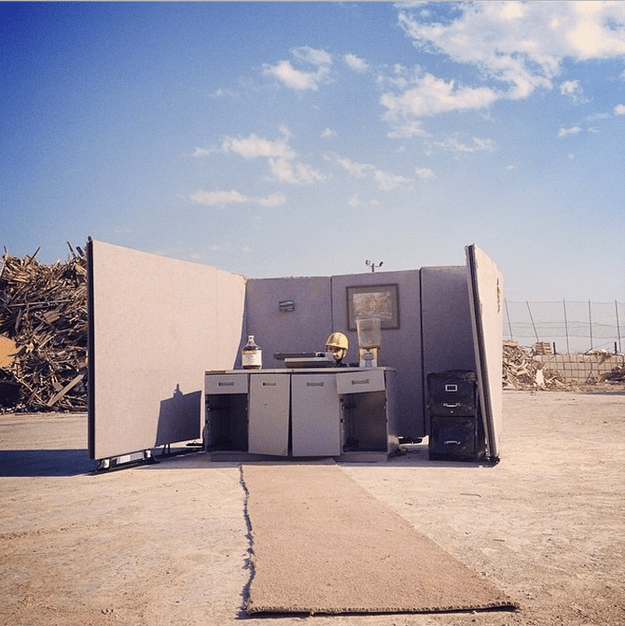 During his residency, Bryan Zanisnik discovered a set of deconstructed cubicle walls that had been ripped out of a local hospital, and used them to erect a series of small, interconnected sets on the grounds. Forming surreal, uncomfortable mini-environments within these superficial white spaces and filming short narrative pieces within them created a simulacrum for the landscape of offices worldwide on the site of an industrial waste recycling plant. Lauren Ruth’s work frequently invokes flags and banners within performance pieces – during her time at RAIR she not only found materials to increase the scale of her previous endeavors, but additionally used the giant machinery available as a mechanism for displaying them. 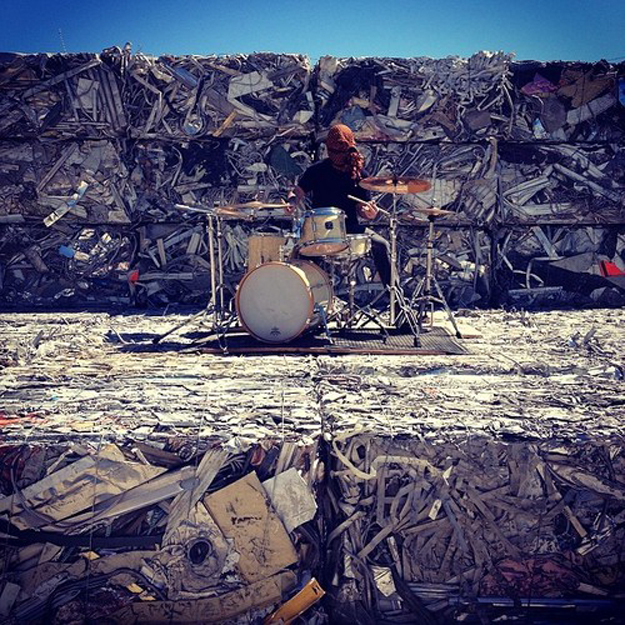 Through her performance piece designed for ICA @ 50, Mary Ellen Carroll (in collaboration with Dufala) created an amphitheater made of bales of crushed metal at Revolution Recovery, providing the site for the Waste Music Festival where a collection of musicians performed passionately to a large, empty space. Activating the power of the sheer scale of the site, Carroll produced a completely convincing premise for a new genre in performance art. Part of this sentiment comes from the work that Revolution Recovery is already doing. 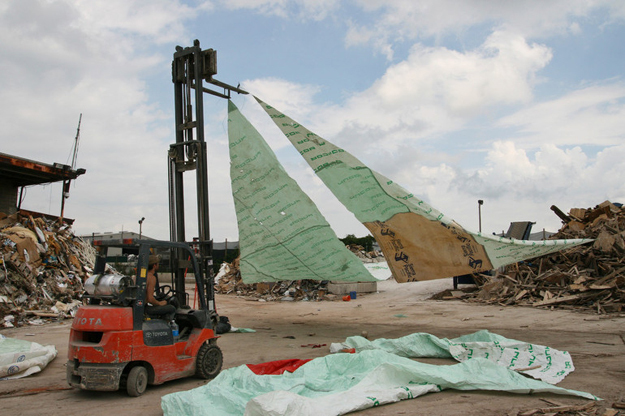 Providing full-service recycling for industrial and manufacturing industries, as well as dumpsters for construction and demolition sites, they sort materials from shrink wrap to carpet to drywall, ultimately recycling around eighty percent of what comes into the site. Their ability to process and repackage these materials makes them cost competitive with landfills. By encouraging artists to use them, Revolution Recovery’s day-to-day operations become accessible to many unaccustomed to seeing the inside of a plant of this magnitude. For artists already used to scavenging the city for usable trash, the centralization of materials provides a valuable resource. This element of his practice is part of what inspired Dufala to pilot a partnership between artists and recyclers. As someone who regularly uses found material in his sculpture, and teaches a course on the subject at PAFA, his studio on the grounds of Revolution Recovery could not be more perfectly located. 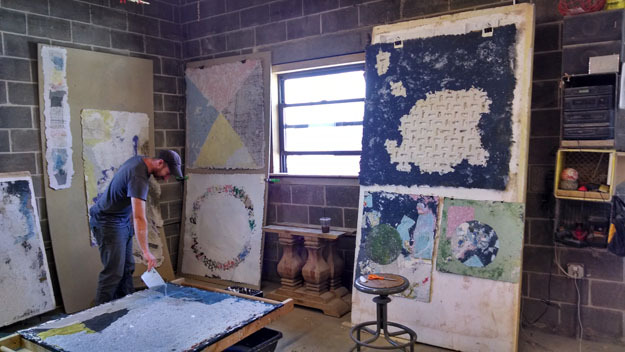 Last month I had the opportunity to visit Revolution Recovery during the residency of artists Kaitlin Pomerantz and John Heron, working collaboratively to create large sheets of handmade paper from pulp composed of matter found at Revolution Recovery and a nearby facility specializing in paper recycling. 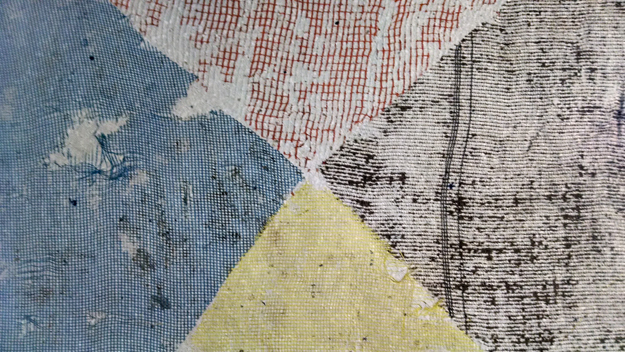 They used various kinds of netting – window screens, sporting equipment nets, industrial mesh – as screens to form a range of textures, shapes, colors and sizes of finished paper. Pomerantz and Heron took some of these pieces to areas where the Delaware River pushed thin, oily streams of water onto the grounds, pulling prints from the skimmed surfaces that resulted in evocative marbling patterns. Both artists often engage actively with issues of environmental sustainability in their own practices, particularly Pomerantz, whose collaboration with botanist Zya Levy – We the Weeds – calls on Philadelphia residents to get to know the local flora. Their project at RAIR is satisfyingly open-ended, yielding a variety of different objects, none of which could have been fully anticipated: a basketball half covered in bits of pulp; a sculptural slip of paper embossed by a manhole cover; and, a soccer net, bowed in the middle, that formed an almond-shaped sheet dotted with little slivers of maps. As the end product of a seemingly endless series of events that led to these materials arriving at the dump, there is something elemental about the work. Its simple mode of manufacturing seemingly reverses the flow of time to an era of hunter-gatherers. Finding creative access into something as ubiquitous as our collective waste stream seems like a necessary step for contemporary artists. Within its inherently hairy aesthetic – filled with the grimy, muddy, random, and messy – there is an overarching element of ultimate practicality at play in RAIR. 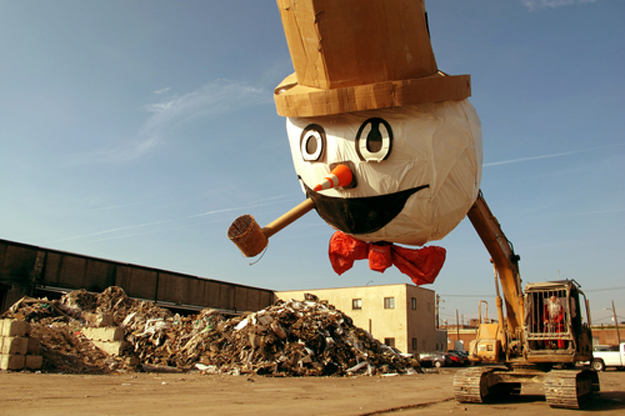 Its open-ended approach to the materials available here ultimately facilitates a more meaningful interaction between Philadelphia’s artists and the seemingly impenetrable world of industrial recycling. The RAIR philosophy is embodied in its policy that artists disassemble and recycle their work once the projects are complete, defining art making as a temporal exercise in both creation and destruction.